This eBook provides an expert and up-to-date overview of the use of biopolymers in the design of smart therapeutic delivery systems, tissue-engineered scaffolds, implants and devices. It also covers future trends in the design and application of biopolymers and their overall potential benefits. The versatility of biopolymer technology and modification is channelled towards the development of advanced drug delivery systems for the treatment of various diseases as well as the elaboration of nanoscale structures for scaffolding. 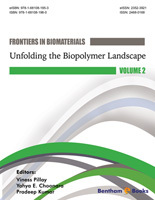 The various chapters of this eBook with contributions from polymer chemists, pharmaceutical scientists, chemists, biomedical and chemical engineers and other allied disciplines show that multi-disciplinarity is key for spanning the frontiers in biopolymer synthesis, modification and applications. The presentation of state-ofthe- art research in the biopolymer area should be most helpful not only to researchers in the field but also to graduate students. Finally, the consolidation of ideas within this eBook, evident through the sterling credentials of the Editor Prof Viness Pillay, generates a unique viewpoint for the conceptualisation of novel biopolymeric systems in future. The biopolymer landscape is undergoing a revolution and illuminates the propensity of certain multifunctional biomaterials to change the way biopolymers are synthesized and applied for the design of scaffolds in tissue engineering, controlling the spatial and temporal release of bioactives into the human body as well as to modulate the physicochemical and physicomechanical properties of therapeutic systems for enhanced form and function. For example at the Wits Advanced Drug Delivery Platform (WADDP) (http://www.wits.ac.za/waddp) we focus on specialized biopolymers that allow us to design therapeutic systems that can perform functions outside their range of conventional capability and into the blue skies realm, including 3D printability. The mechanized uniqueness of biopolymers is embodied not only in their macroscopic structural changes, but also in their ability to respond to varying stimuli, reversibly change their shape or even behave as in vivo tissue or organ surrogates. Such biopolymers have been applied in a vast array of biomedical applications that include stimuli-sensitive bioactive delivery systems, intelligent medical and surgical devices, tissue engineering, or implants for minimally invasive surgery. In this eBook, we provide a topographical view of the tortuous biopolymer landscape and elaborate on the fundamental molecular mechanisms and physical dynamics of polymer behavior that bring about their advanced function. Furthermore, we highlight the diverse stimuli that instigate biopolymer function and discuss those that have undergone modification, functionalization and customization for specialized biomedical applications. We would like to thank the experts who have made immense contributions to the various Chapters within this eBook and have emphasized the fact that certainly the biopolymer landscape is far from flat. The future is exciting.